Jim Chrysler has over 30 years of piloting experience. 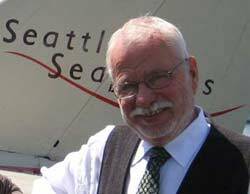 He has proudly owned and operated Seattle Seaplanes (formerly Chrysler Air) for over 15 years. He has logged more than 20,000 hours of flying time and countless water landings. At Seattle Seaplanes, we take pride in our high standards of service! Our experience and enthusiasm will be evident when you choose to fly with us. We're ready to take you there! Jim and the entire Seattle Seaplanes crew look forward to welcoming you on-board our seaplanes! Gift certificates are available for all of our flying services. Gift certificates can be purchased for single travelers or groups of travelers. Floatplane trips make the perfect unique gift for that hard-to-find-something-for person! A seaplane flight is an unforgettable experience. Contact us today to find out more about purchasing Seattle Seaplanes Gift Certificates. What better way to show off your visit to Seattle than the latest fashion merchandise from Seattle Seaplanes? We offer shirts, hats, tote bags and much more. Be a trendsetter with the latest wares from Seattle Seaplanes.